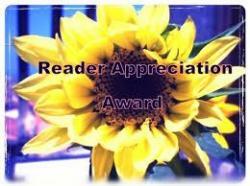 Today we have a guest post from Jennifer Lutz of the Christmas Tree Market. Enjoy! 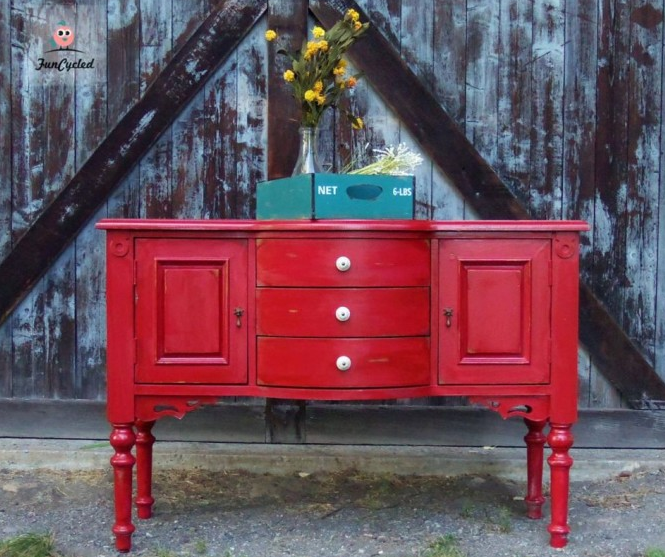 A pop of color is a great way to give old furniture a fresh, new look. There are many reasons, sentimental or practical, why I hold on to old furniture. It could be a hand-me-down from a loved one, a keepsake from an important time of our lives, or simply a sturdy piece that still works well. While old furniture may appear a bit shabby or outdated, sometimes you only need to scratch beyond the surface to discover a real gem underneath. Painting old fixtures with bright, bold colors is easy and the results can be stunning. Making full use of a reliable piece of furniture not only saves you money, but also gives you a fascinating makeover tale to share with friends. Photo via Natty by Design. Breathe new life to a well-used dresser with a fresh coat of paint to give it some character and style. A painted dresser catches the eye and gives a room a friendly, welcoming ambiance. Natty by Design recently transformed a humdrum brown dresser into a dramatic piece. Start off by wiping the dresser with a dry rag, then cleaning it with mild soap and water. Lay down some used paper or a drop cloth underneath it. Use fine sandpaper to smooth out rough spots. Lightly sanding the surface or applying a coat of primer allows new paint to stick better. Remove or cover any hardware or parts you don’t want painted. When the primer has dried, use a paint or foam brush to apply the first coat of paint. Apply the second coating after a couple hours or when the first coat is already dry. Feel free to replace old knobs with ones that you like. A chair that has lost its original luster can be revamped with a simple coat of paint. 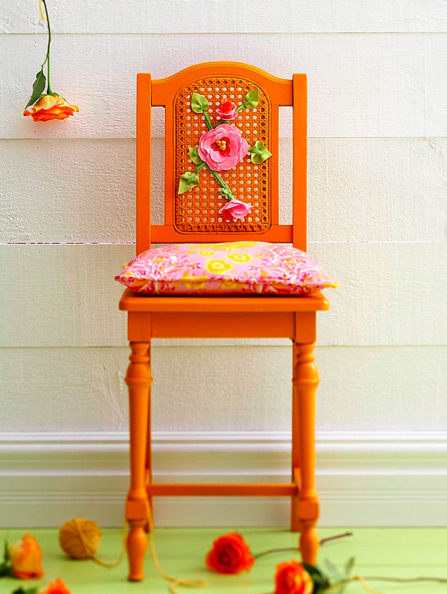 Debra Wittrup of BHG shows how a spray of bright paint gives an old chair a bright, cheery look. If you want something more in line with spring, you can pair the chair with a colorful patterned cushion. Helpful Tip! Glossy paint tends to highlight imperfections in furniture much more than matte. For a smoother finish, try dipping 400-grit sandpaper in water and sanding between coats. 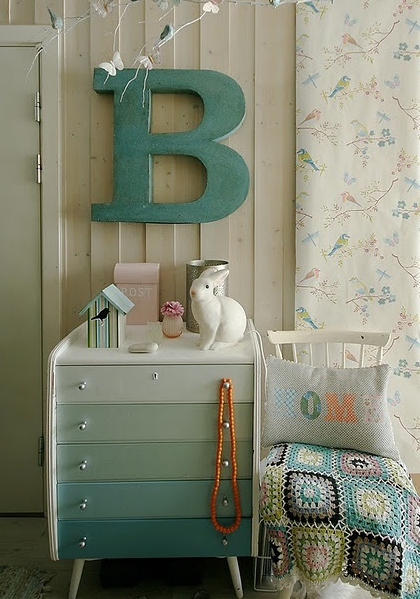 Photo via Norske Interior Blogger. Furniture from the 50’s and 60’s have gorgeous clean lines that give them a timeless appeal. Transport mid-century fixtures into the future by painting them in various shades of a single color. A chest of drawers with a color gradient is an irresistibly cute piece that’s perfect for your little one’s room. Helpful Tip! Painting the top of a piece of furniture requires extra care. What I do is work my way up from the legs first. I also use a roller for a smooth, even finish. To prevent sticking or unsightly marks, give your newly painted table top sufficient time to dry before placing objects on it. Photo via Lemon Drop Life. Most of the time, we have pieces of furniture that are still in great shape but not really much to look at. Dacia of Lemon Drop Life transformed a drab changing table into a bright ray of sunshine in the nursery by sanding it down and painting it a happy yellow shade. Helpful Tip! To keep a painted surface pretty, I coat it with a water-based lacquer finish to protect against stains, marring, and fingerprints. Spare that poor forgotten buffet table a trip to the landfill. With a little elbow grease, Sarah from Funcycled turned a simple little hutch into a bright, beautiful addition to the dining room. Incorporate her idea into your favorite buffet table that has seen better days by painting it a bold color that lets it stand out. Subtle distressed edges liven up the look even more. Helpful Tip! Achieve the distressed look on paint quickly and easily by lightly sanding the edges and corners of your furniture with fine sandpaper. 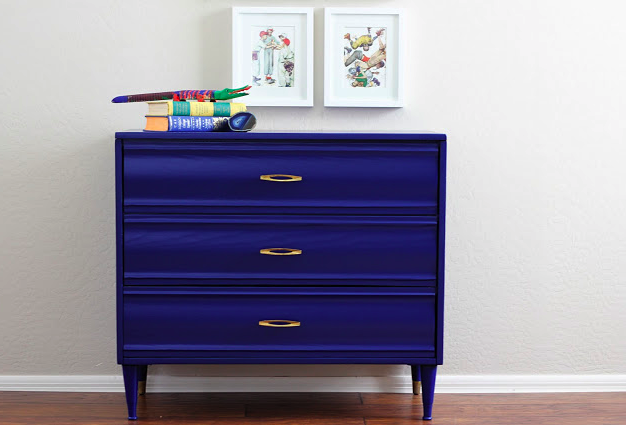 Using bright colors to renew furniture can be fun and the results can be so rewarding. Show off your creativity while saving some cash with these inspiring DIY projects. Jennifer Lutz blogs about home decorating at the Christmas Tree Market blog. The blog is part of Christmas Tree Market where you can choose an artificial Christmas Tree to suit your home décor. Categories: DIY | Tags: DIY furniture, furniture makeovers, interior design, painted furniture, refurbished furniture | Permalink.